Correspondences. An online Journal for the Academic Study of Western Esotericism. Call for papers. Deadline: feb. 28, 2013. Correspondences seeks to create a public academic forum devoted to discussion and exposition of issues and currents in the field commonly known as ‘Western Esotericism.’ The editors acknowledge that the use of “Western esotericism” as an umbrella term for a widely variant field of alternate scientific and religious ideas is problematic. Thus, articles related to esoteric currents from other global cultural centers may be accepted if a connection to “alternative” currents in “western culture” is implicitly established. The following list of areas of study is provided for clarification: Alchemy, Anthroposophy, Astrology, Eco-spirituality, Esoteric art, literature, and music, Freemasonry, Geomancy, Gnosticism, Hermeticism, Illuminism, Initiatory secret societies, Kabbalah, Magic, Mesmerism, Mysticism, Naturphilosophie, Neo-paganism, New Age, Occultism, Occulture, Paracelsianism, Rosicrucianism, Satanism, Spiritualism, Theosophy, Traditionalism, Ufology, Witchcraft. Correspondences encourages submissions from a variety of methodological and disciplinary approaches, such as: History of Religions; Sociology; Art History; Philosophy; History of Science; Literature; ; and Cultural Studies, just to name a few. Jimmy Elwing, rMA student, Universiteit van Amsterdam, The Netherlands. Aren Roukema, rMA student, Universiteit van Amsterdam, The Netherlands. Egil Asprem, MA, Researcher, Universiteit van Amsterdam, The Netherlands. Dr. Henrik Bogdan, University of Gothenburg, Sweden. Dr. Juan Pablo Bubello, Universidad de Buenos Aires, Argentina. Dr. Dylan Burns, University of Copenhagen, Denmark. Dr. Peter Forshaw, Universiteit van Amsterdam, The Netherlands. Christian Giudice, PhD student, University of Gothenburg, Sweden. Dr. Amy Hale, St. Petersburg College, United States. Prof. Boaz Huss, Ben-Gurion University of the Negev, Israel. Prof. Birgit Menzel, Universität Mainz, Germany. 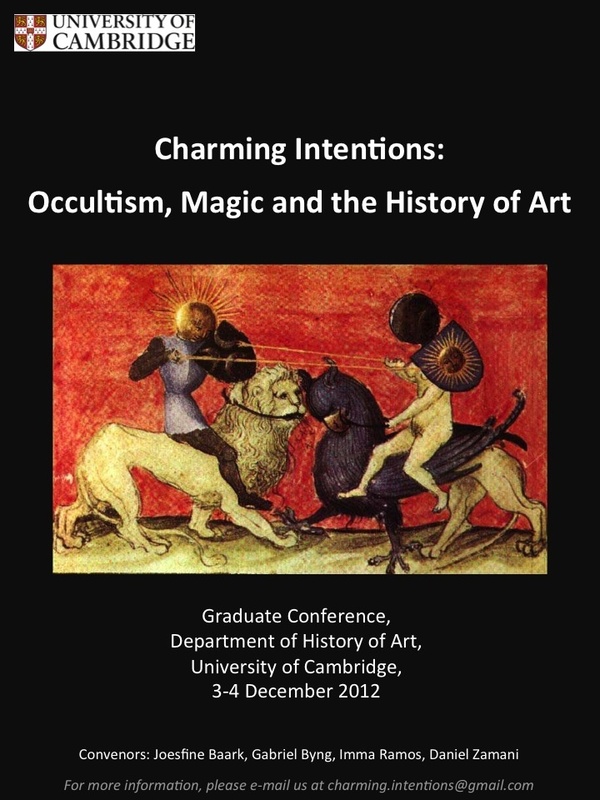 This two-day graduate conference will investigate the intersections between visual culture and the occult tradition, ranging from the material culture of ‘primitive’ animism, through medieval and Renaissance depictions of witchcraft and demonology, to the contemporary fascination with the supernatural in popular culture. The conference aims to provide a stimulating arena for the presentation of innovative research in this field as well as to offer a vibrant and thought-provoking forum for scholarly discussion and exchange. We welcome papers from current and recent graduate students from all disciplines, provided their research engages with material, visual or symbolic aspects of magic and occultism. * The supernatural and the spiritual in modern and contemporary art; * Occultism and magic in contemporary popular culture. N.B. : Presentations should not exceed a maximum of 20 minutes and will be followed by a 10-minute Q&A session. The sessions will be chaired by senior scholars within the University of Cambridge’s History of Art Department. We also hope to publish selected conference papers in a book of proceedings. alongside a CV of 1-2 pages. Deadline for submission is the 30th of September 2012. All abstracts will be peer-reviewed and successful applicants will be notified about acceptance of their papers before the 15th of October 2012. Early applications are strongly encouraged. Josefine Baark, PhD Candidate, Homerton College Gabriel Byng, PhD Candidate, Clare College Imma Ramos, PhD Candidate, Pembroke College Daniel Zamani, PhD Candidate, Trinity College.